The number of MPs from Scotland will be cut from 72 to 59 in time for the next UK general election. 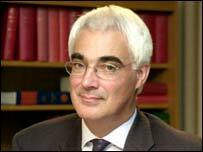 Scottish Secretary Alistair Darling has received the final, formal report from the Boundaries Commission. He told MPs he intended to lay parliamentary orders as soon as possible to bring these changes into place in time for the next election. The government plans to bring Scottish constituencies into line with the size of English seats. These have an average of 69,000 electors. The Scotland Act, which paved the way for the establishment of the Scottish Parliament, contained an agreement to end the anomaly of Scotland's over-representation at Westminster. Mr Darling said he had finally received the Boundary Commission's report just 30 minutes before Scottish Questions in the Commons on Tuesday. "Under the Parliamentary Constituencies Act I will be laying a report before this house as soon as I have had the opportunity to consider that, but I expect to do that very shortly indeed," he said. Shadow Scottish Secretary Peter Duncan pressed Mr Darling for a more specific timescale and voiced concern that the government was "seeking to evade its responsibilities". Mr Darling replied: "I have the report. I need to consider it - it comprises some 17 chapters, I understand, which I will have to look at. "But I intend to lay this order as quickly as possible. All being well - assuming it gets the approval of both houses - I hope it will be in force in February, in ample time for an election that may take place next year or indeed the year after." The report itself will not be published until it is laid before parliament. However, it is not expected to signal any change to the series of recommendations made by the Boundary Commission on the future shape of MPs' constituencies. The final recommendations in the fifth periodical review were released in December last year. The proposals follow a lengthy consultation exercise and a series of public inquiries. Mr Darling is among the MPs whose constituencies are in danger of disappearing. Chancellor Gordon Brown's Dunfermline East seat is also under threat amid proposals to reduce the number of Fife seats from five to four. Last year the Boundary Commission rejected calls to retain the Hamilton North & Bellshill constituency held by Health Secretary John Reid. He and the Scottish Labour Party argued against the proposals for North Lanarkshire and East Dunbartonshire at a public inquiry. Five new constituencies would be created in an area which currently covers five seats and takes in parts of two others.